The glass island of Murano near Venice: information about glass factories, glass making, demonstrations by glassblowers and Murano glass products. Murano is an island just a good kilometre away by water bus from the north of Venice. Every day many thousands of tourists come to the island. The most important sight is glass - the glass factories, the glass production demonstrations, the glass museum and last but not least the many glass products that are offered for sale to the visitors of the islands.. The production of glass has a very long tradition in Venice. The first glass in Venice was probably produced just before the year 1,000 AD. But there was a problem from the beginning. For the production of glass larger, very hot furnaces are necessary. These caused fires again and again, sometimes whole districts burn down. Long discussed what one should do, the glass industry boomed and was in the 12th and 13th century an important economic sector in the rising Venice. In the year 1295 the Doge (head of Venice) made the decision to ban the glass factories in the old town of Venice and to relocate all glass furnaces to the island Murano, which was about one kilometre away. The glass factories quickly became the most important industry on the island of Murano. Until today there are many glass factories there. For more than a century, Murano has been the leading place of glass production in the world. For a long time, the secrets of glass making, such as production techniques, colours, etc., were well guarded. For a long time, it was forbidden for any Maestro to leave Venice for life. Non-observance of this law was at times even punishable by death. The comet of Murano, a metres-high work of art made of blue glass on a central square on the island of Murano, developed into a landmark of the island of glass near Venice. Even today, glass is extremely important for the economy of Murano. Many of the world's leading glass artists live and work on the island. In addition, many tourists come to Murano. They come for the glass. They look at the glass factories, visit the glass museum and, last but not least, buy high-quality glass products. It is estimated that there are over 100 shops on the island selling glass products in all sizes, shapes and colours. How do I get to Murano? It's an island one square kilometer in size. It can only be reached by boat, from Venice or from another island. The public ferries (water buses) between the old town of Venice and Murano run several times an hour during the day. It is best to buy a time ticket for several days (see box), as normal tickets in Venice are very expensive. You pay 7,50 Euro for the one way ticket. What glass products are made in Murano? There is almost everything imaginable made of glass. 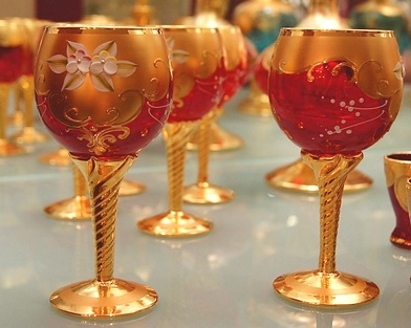 On the one hand there are the usual products such as drinking glasses, bowls, chandeliers or vases. But there is much more, there are no limits to the imagination. For example, animal figures, whether cute penguins or evil scorpions, are popular among tourists. Other examples are models of typical Venetian glass houses, ships and even Christmas trees. Also products with the design of the US flag for American tourists can be found in many shops. Much is kitsch, but other things are artistically very valuable. There are many bigger and smaller shops on the island of Murano that offer the glassware. You can buy a small glass souvenir for 5 euros or less. Some things cost thousands of Euros. We were very impressed by many glass products. There are really beautiful and top modern things made of glass on the island. 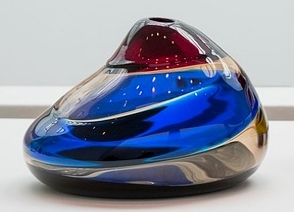 As I said, many of the best glass designers in the world work in Murano. 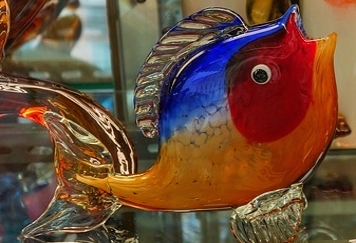 Most tourists visit a glass factory, for many it is the highlight of the day trip to Murano. Several glass factories have a public demonstration where you can watch a Maestro (master glassblower) doing his art. As soon as one leaves the ferry upon arrival on the island, one is already being talked to by some rather obtrusive employees of some glass factories. Their goal is to lure as many people as possible into the respective glass factory. The idea behind it: Tourists after the more or less good demonstration of glass blowing to sell products of the company in the factory's own shop. The glass factories have large sales rooms, through which one is guided after the glassblower show. Most glass manufacturer shows are free of charge. We liked a show that didn't require any advertising on the ferries. 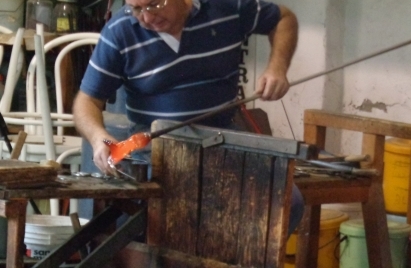 The glass company Guarnieri's demonstration is also recommended by most serious travel guides. This demonstration costs 3 Euro entrance fee, but it's worth it. A Maestro (master glassblower) makes a glass product with a helper, during our demonstration it was a colourful vase. A third, very nice man explains the working procedures alternately in English and Italian. For the visitors, a small grandstand is set up just a few metres away from the Maestro's workplace. The Guarnieri company is located near the Colonnia vaporetto jetties in the south of the island. One goes from the jetty approximately 100 meters along the sea - thus not along the canal into the interior of the island, but in the other direction, at which the sea is on the left side. Approximate location of the company Guarnieri on Murano with the interesting glass show. 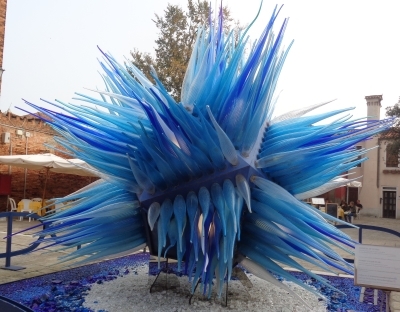 Another highlight in Murano is the Museum of Glass and Glass Art. It is one of the most famous glass museums in the world. In several rooms, glass from past centuries and from today is exhibited. Many high-quality and interesting glass products from the present can also be seen in the many shops in Murano.